Please note: the images below are taken from the German user interface but the program can instantly be switched to English language version. incl. Syntax highlighting and emphasizing of keywords. 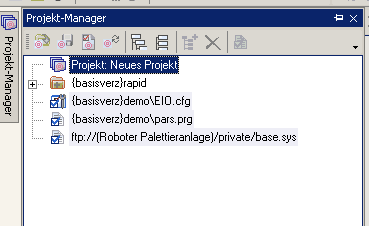 allows managing of project related files and settings. Arbitrary files (local or FTP) and directories (incl. subdirectories) can be assigned to a project. (Automatic) Syntax check of source files. A Syntax check determines whether the source files are constructed in accordance to the syntax rules and structure of the language definition. The check detects errors which usually arise from mistyping of keywords or missing characters, for example "missing semicolon at end of statement". 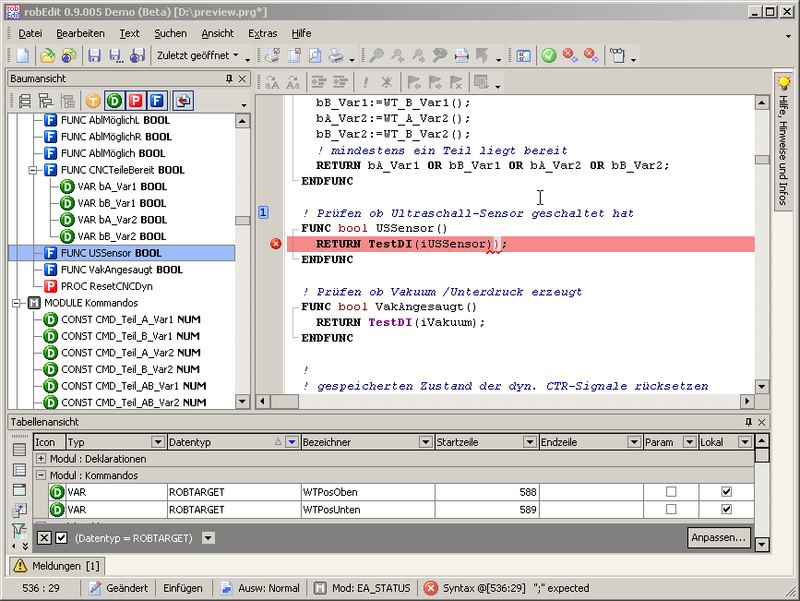 Detected errors are shown in an error list and simultaneously marked in the source files. A Syntax check can be initiated manually or in automatic mode, i.e. if input of text is discontinued for a certain time, a Syntax check is performed automatically after a configurable delay. (Automatic) Semantic check of source files. Among others, a Semantic check analyzes the source files regarding object references and compatibility of data types. At the beginning of every Semantic analysis, a Syntax check is performed. A Semantic check can be initiated manually or in automatic mode, i.e. if input of text is discontinued for a certain time, a Semantic check is performed automatically after a configurable delay. (Standard-PC with AMD Athlon™ 3000+). Determination of access counters and cross reference. 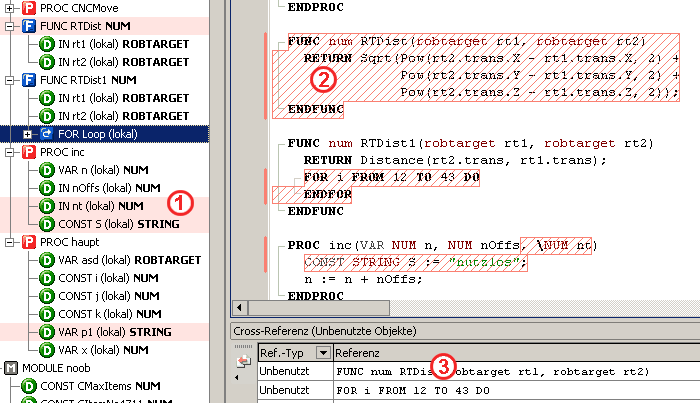 During a Semantic check the accesses to objects (type, data, code) are counted. Besides the counting of these accesses also position and type of access (definition, declaration, read, write, call, jump) are recorded for each object. In this way a list of accessing references is created and can be displayed for each object. This list is called "Cross Reference". Detection of unused objects (Types, Data, Code). By evaluating the access counters of objects after a Semantic check, it is possible to determine objects which are not accessed by your code (counter = 0). This objects are called "Unused Objects" or simply "Unused". Unused objects can be removed from the source text without having effects on the program's flow or correctness. All these settings are user configurable or can by switched of. Highlighting of block-structures and -nesting. During a Syntax check the block-structures and -nestings of the source code are analyzed and after that these blocks are accordingly highlighted within the text editor. replaces text shortcuts with prototypes of procedures/functions or complex text blocks (templates). With a certain click or keypress on an identifier (constant, variable, routine, etc.) a direct jump to the identifier's declaration is performed. Every jump is saved on a stack to allow an easy return to the original identifier location. When moving the mouse cursor over an identifier, a small info window (hint) is displayed, showing information about the identifier's declaration. Integration of an external help file. For legal reasons it is not permitted to deliver robEdit® with an original documentation for the RAPID programming language. In order to create an equivalent functionality, it is possible to integrate an external help file into the robEdit® environment. Even the context sensitive search for keywords in this external help file is possible. Bookmark positions are saved as comment within the source files, so bookmarks are not lost when a file is closed. Toolbars and panels can easily be customized with Drag/Drop operations.